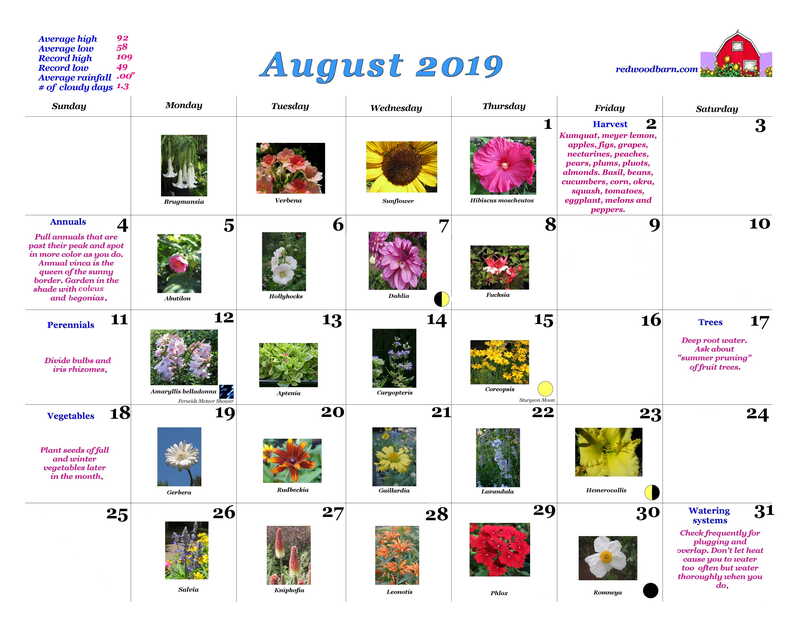 Click here for printable monthly calendar! Lawn: Aerate if water is running off rather than soaking in. Brown patches are really showing up now; see May. Roses: Keep fed and evenly moist. 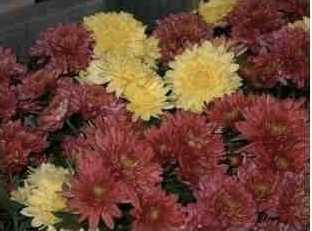 Cut buds early on hot days as heat will blast the flowers. Keep hips (seed heads) removed. Trees: Continue deep-root watering through the summer. Mulching helps conserve moisture and keep roots cool. Annuals: You can still plant celosia and cosmos, and spot in heat-loving flowers like vinca. Brighten shady areas with impatiens, begonias. Vegetables: Last plantings of corn and beans. Harvest summer vegetables regularly to keep them producing. Weather notes: The greatest number of successive days over 100 degrees was in July, 19868 in a row. Pests and diseases: Squash bugs and aphids on pumpkins, squash. Whiteflies are starting to build up. Shop now for... Crape myrtles, subtropicals. Roses: Groom and water. Don't feed when it's really hot. citrus and apply F.S.T. or sulfur. Shrubs: Water. Feed acid loving plants and apply F.S.T. or sulfur. Annuals: Pull annuals that are past their peak and spot in more color as you do. Annual vinca is the queen of the sunny summer border. Garden in the shade with impatiens and begonias. Perennials: Divide bulbs and iris rhizomes. 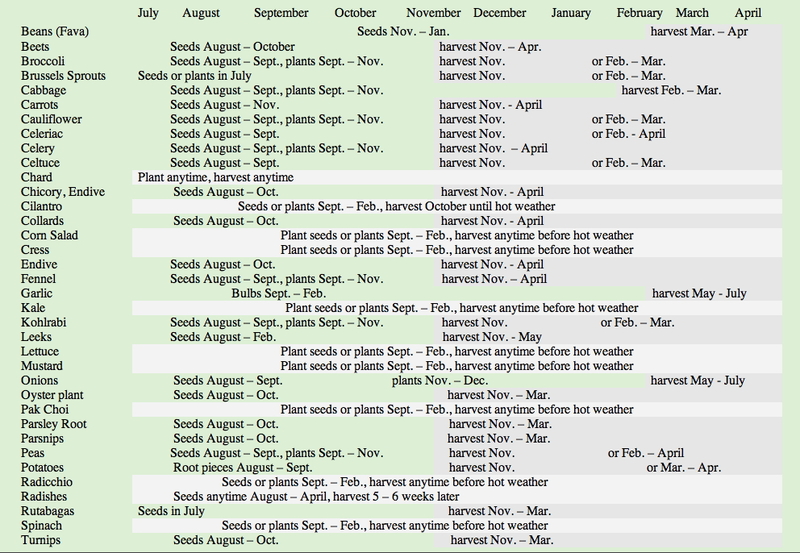 Vegetables: Plant seeds of fall and winter vegetables later in the month. 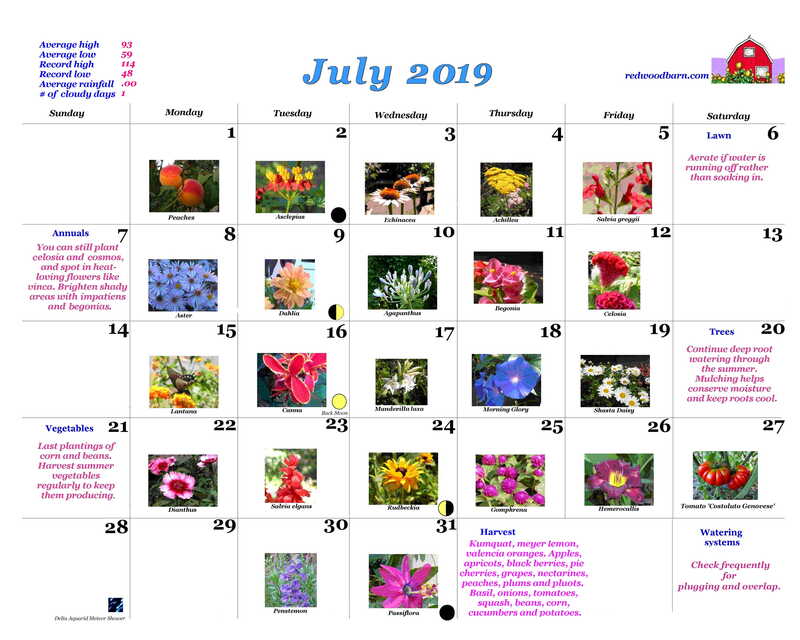 Watering systems: See June. Don't let the heat cause you to water too frequently, but water thoroughly when you do. Pests and diseases: Whiteflies, leafhoppers; rust. Shop now for: Drip irrigation systems. 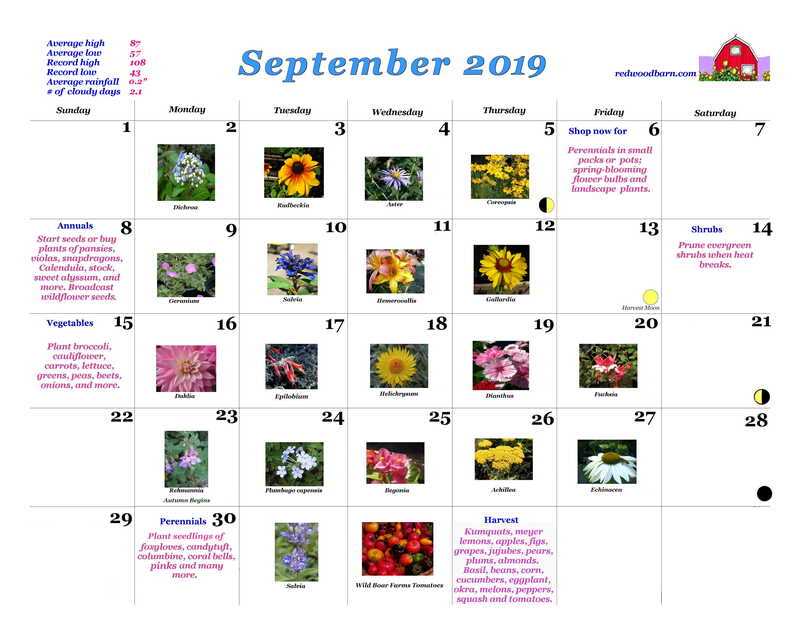 Click here for printable September calendar! 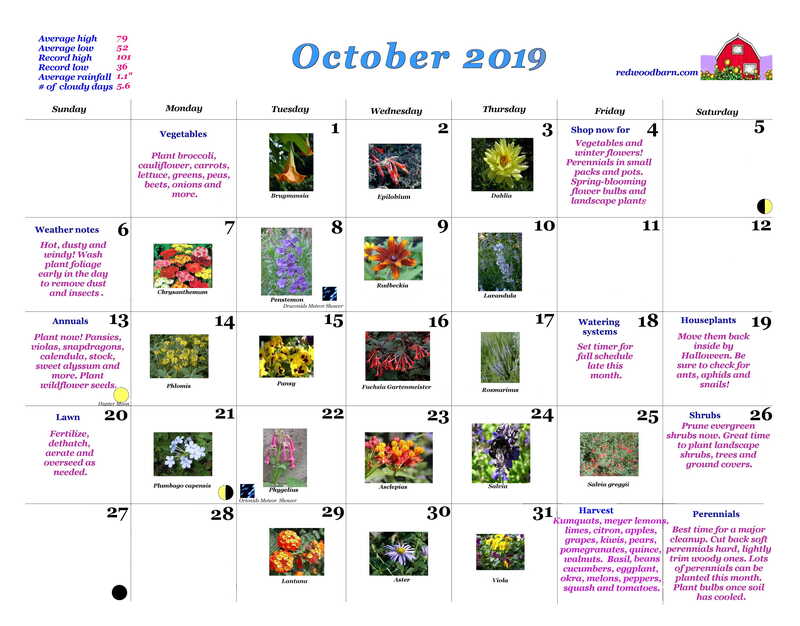 Click here for printable October calendar! Lawn: Fertilize lawn with a regular lawn fertilizer. Renovate if heat breaks de-thatch, aerate, overseed. Roses: Fertilize mid September to early October to get a great fall bloom. Shrubs: Prune evergreen shrubs when heat breaks. Plant landscape shrubs, trees, and ground covers. Move existing landscape plants. 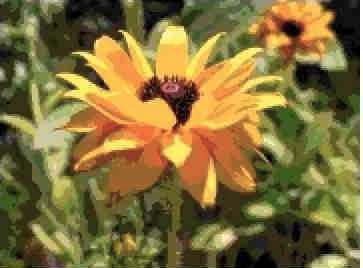 Annuals: Start seeds or buy plants of pansies, violas, snapdragons, calendula, stock, sweet alyssum, and more. Broadcast wildflower seeds. Perennials: Lots of perennials can be started from seed this month: foxgloves, candytuft, columbine, coral bells, dianthus, and many more. Preemergents or mulches will help prevent annual winter weeds. Cut back herbaceous (soft) perennials hard; lightly trim woody ones. Best time for a major cleanup in the perennial border. 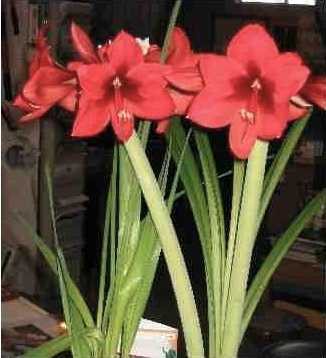 Plant bulbs when soil has cooled. Vegetables: Plant broccoli, cauliflower, carrots, lettuce, greens, peas, beets, onions, and more. Watering systems: Set timer for fall schedule late this month. Pests and diseases: Whiteflies, leafhoppers, spider mites. 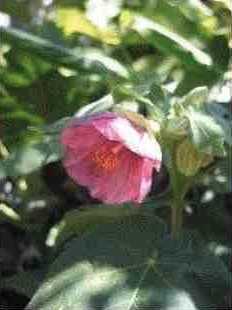 Shop now for: Perennials in small packs and pots; spring-blooming flower bulbs; landscape plants. 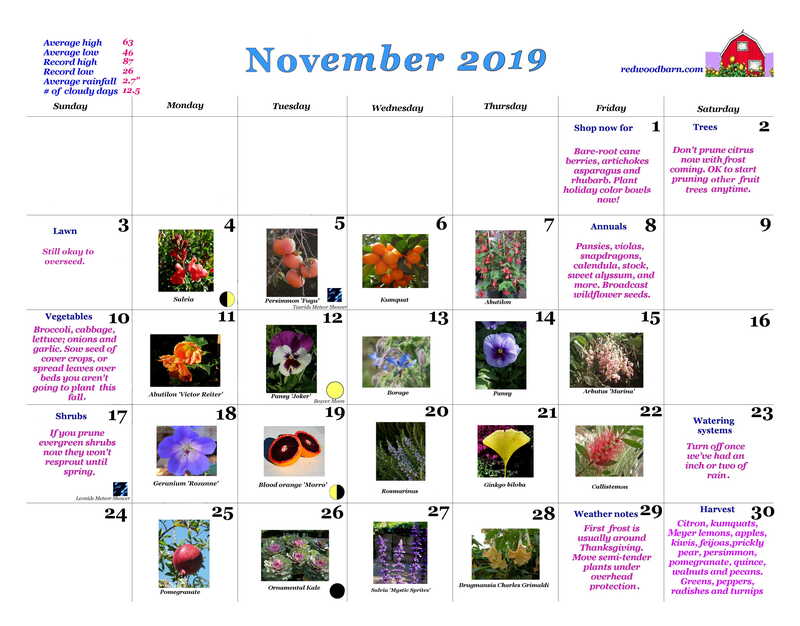 Click here for printable November calendar! Lawn: Fertilize with a winter-type fertilizer. Still OK to renovate early in the month. Shrubs: Don't prune evergreen shrubs nowthey won't resprout until spring. Perennials: cyclamen, primulas; spring flowering bulbs. Vegetables: Broccoli, cabbage, lettuce; onions and garlic. Weather notes: First frost usually around Thanksgiving. Move semi-tender plants under overhead protection. Watering systems: Turn off once we've had an inch or two of rain. Pests and diseases: Snails, slugs, caterpillars, aphids, leafhoppers, whiteflies. Shop now for: Berry plants. 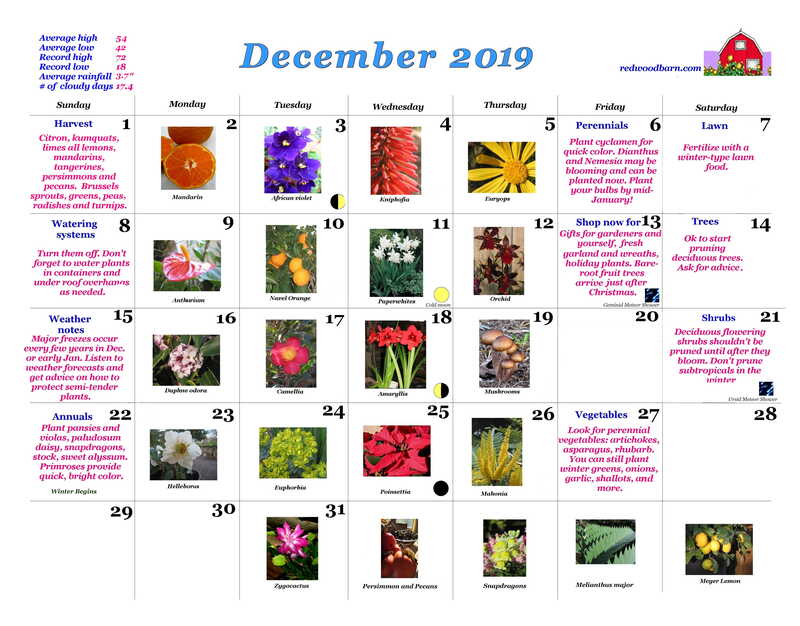 Click here for printable December calendar! Lawn: Fertilize with at winter-type lawn food now or in January. Roses: OK to start pruning now. You can move rose bushes when they are dormant, now through mid-February. Trees: OK to start pruning deciduous trees. Ask for advice! Shrubs: Hardy evergreen shrubs can be pruned, but they won't regrow until spring. 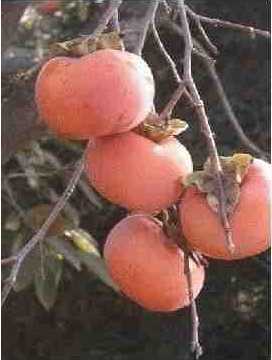 Deciduous flowering shrubs should not be pruned until after they bloom. Annuals: Plant pansies and violas, snapdragons, calendulas, stock, sweet alyssum. Primroses provide quick, bright color. Perennials: Plant cyclamen for quick color. Dianthus may be blooming and can be planted now. Plant your bulbs by mid-January! Vegetables: Look for perennial vegetables: artichoke, asparagus, rhubarb. You can still plant winter greens, onions, garlic, shallots, and more. Weather notes: An early freeze such as we had in Dec. 1990 (16 degrees!) would be highly destructive. Listen to weather forecasts carefully and get advice on how to protect semi-tender plants. Watering systems: Probably time to turn them off. Water plants in containers and under roof overhangs as needed. Pests and diseases: Check plants that you brought indoors for aphids, mites, mealybugs, scale insects. Most can be managed with a thorough spray of water. Give 'em a shower! Shop now for: Gifts for gardeners and yourself, living Christmas trees, fresh garland and wreaths, holiday plants.